On pages 7 and 8 under the title “Call To Action” it is written: “The interconnected industries of banks, credit bureaus, and collection agencies have an enormous impact on the spiritual, emotional, and physical well-being of families and individuals. Darwinian capitalism, evidenced in part by an absence of corporate ethics and responsibility, has caused a human rights crisis and many religious leaders do nothing about it. Fortunately, some are beginning to see the magnitude that debt (usury) has on the spiritual, emotional, and physical lives of their parishoners. Individual and collective consumer debt, which provides banks with a permanent, if not long-term revenue source, is increasingly being compared to modern slavery or debt serfdom. As banks exploit or enslave consumers, executives in the financial service industries are expected to receive a record $144 billion in benefits and compensation in 2010. It is a 4% increase over last year. On the back cover of the book it is written: “In this second edition, Bishop Paul Peter Jesep, documents that credit card usury is legal, widespread, and perceived as a legitimate form of commerce. Yet it causes despair, hopelessness, physical pain, emotional torment, and financial servitude. Long-term consequences due to a poor credit score include difficulty finding employment, higher car insurance, the ability to secure safe and affordable housing, and in some cases ineligibility for needed educational loans. The book is now available at Amazon at this link: http://www.amazon.com/Credit-Card-Usury-Christian-Failure/dp/145375329X and probably at other book stores also. I have sent this letter to various clergy from different religious organizations and I either got a form letter back which says thank you for you letter or in most cases there was absolutely no response at all. 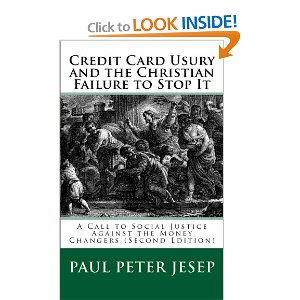 If any reader knows any clergy members who are ready and willing to address the evil and immoral aspects of usury, then please invite them to (a) read Peter Paul Jesep’s book and (b) spend some time reading the information compiled at The UsuryFree Eye Opener. Thanks, I will bookmark this page and use it... really very help full blog.Keep on posting stuff like this.